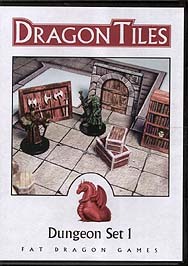 Dragon Tiles literally adds a new dimension to boring miniature tiles. We've combined 2D tiles with 3D props, allowing you to create a visually stunning tabletop for your players quickly and easily. This set includes over 50 dungeon tiles and all of the props shown (including the eye beast!) All files are Adobe PDF format and are PC and Mac compatible. All models are designed for the novice card modeller and the designs are simplified to ease construction time. Most models including our exclusive E-Z Fold doors assemble in minutes. Visit our forums for tips and advice on assembling your models.